This is a unique nesting doll. Inside the wood burned and painted mushroom you will find a small rod and tiny wooden fruit, mushrooms and eggs that can be picked up with the hook at the end of the rod. 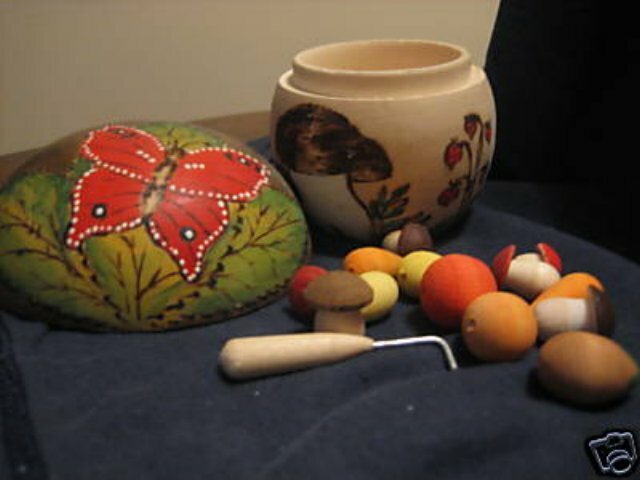 The mushroom cap is painted with garden scenes of leaves, flowers, mushrooms, lady bugs, a beetle, and a large red butterfly on a green leaf.